"This is the thing that troubles me, for I cannot forget Carcosa where black stars hang in the heavens; where the shadows of men's thoughts lengthen in the afternoon, when the twin suns sink into the lake of Hali; and my mind will bear for ever the memory of the Pallid Mask." Fantasy Flight Games is proud to announce the upcoming release of Echoes of the Past, the first Mythos Pack in The Path to Carcosa cycle for Arkham Horror: The Card Game! The King in Yellow has come to Arkham, you caught the performance, you found yourself drawn into a maddening series of events, and now—however hard you might try—you cannot erase them from your mind. Nor can you ignore the play's sinister history of disappearances, suicides, delusions, and insanity. There are powerful forces at work. Of that you can be sure, but there's very little else of which you can still be certain. The things you've witnessed are things no man nor woman should ever see. And the world seems to have shifted all around you, leaving you adrift, washed along by a current running swiftly into a sea of madness. Where do you go from here? The more you investigate, the greater the odds you'll challenge your limited sanity. But if you don't pursue the leads you've already uncovered, would you be inviting a new doom to Arkham? And why has this play come from Paris to Arkham in the first place? If there are ties between the play and Arkham, there's one place where you might uncover them. Filled by questions, desperate for answers, striving to keep your composure—you make your way to the Arkham Historical Society. 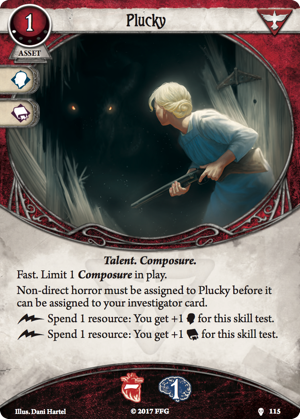 Two major themes run through the player cards in Echoes of the Past, and the first centers around your investigator's ability to remain calm and composed in the face of utter chaos. The Mythos Pack offers each of the game's five classes a new one-cost asset with two traits—Talent and Composure. And these assets share more than their cost and traits. Like Plucky (Echoes of the Past, 115), they are all level one cards, they all sport the Fast keyword, and they all offer semi-permanent access to two easy skill boosts. Why are these skill boosts "semi-permanent"? There are two reasons. 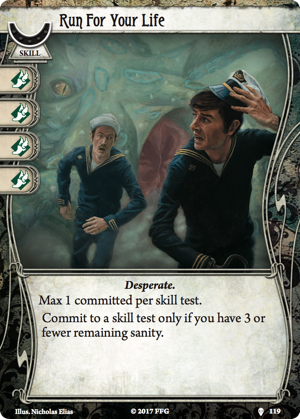 The first is because the Permanent keyword is a real thing in Arkham Horror: The Card Game, and none of these cards sport it. You still have to draw these Talents and then pay to play them. The second reason is because they remain in play only so long as you can maintain your composure. They function in the game the way that your mental and emotional states function in real life. Play the asset, and you're effectively entering a state of calm, gathering your thoughts, thinking clearly, and finding answers to the problems around you. But start going crazy—i.e. suffering horror—and the first point of indirect horror you would apply to your investigator must instead be applied to the asset, discarding it. The result is that these Composure assets push the game one more step in the direction of roleplaying, immersing you in a world of mind-shattering horrors and adding a real, game-changing edge to your concerns for your investigator's precarious mental health. Stay calm, stay cool, and you can more easily influence your surroundings. But should the strain of a shifting reality prove too much? One horror leads swiftly to the next as your plans rip and unravel. And how can you possibly complete your investigation as you're suddenly, surely losing your mooring? When your adventures thrust you into such wildly disorienting situations that the game actually offers you rules to measure and quantify your Doubt? When you can almost feel your mind and sanity flayed like skin? Such times are certain to lead to desperation. And that desperation may—it turns out—be the only thing you really have going for you. 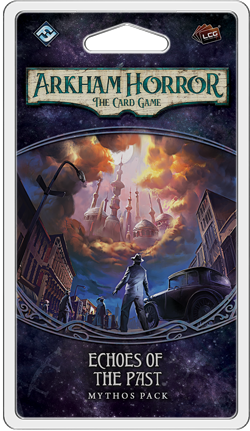 In a world of otherworldly monsters, ritual magic, and elder gods, the investigators of Arkham Horror: The Card Game are all too human. You don't even get to start your adventures with a deck built completely to your strengths. You have your weaknesses, too. But you may also discover that when you're pushed to your limit—when the adrenaline courses through your body and your "fight or flight" instinct kicks in—the world slows down just a little. There's just a glimmer of hope that wasn't there before. Sure, the odds are still stacked heavily against you, but your Desperate situation clarifies matters somewhat. If the only way for you to survive your encounter with some gibbous, tentacled mass or lunatic cultist is to Run for Your Life (Echoes of the Past, 119), well, you just might find yourself a better sprinter than you had ever imagined. Sucking wind, your heart exploding in your chest, your eyes stinging with the smoke through which you navigate your way out of a fiery wreck. Sure, this Desperate evasion might not help you gain the clues you need to solve your mystery. Nor will it destroy the monster. But sometimes you just need to focus. And there's no greater focus than the four different Desperate skill cards in Echoes of the Past, each of which offers four skill icons if your nerves have been left so raw that you're down to three or fewer points of sanity remaining. What will you find in the Historical Society? What will you learn about The King in Yellow? And what dangers will you face? Will you confront them coolly, overcoming each new trial while maintaining your Composure? Or will you find yourself surprised by extra-dimensional powers and Desperate to hold onto the last of your shattered sanity? Or will you go a different route entirely and embrace the madness? The choice—along with so many others—will be yours to make when Echoes of the Past (AHC12) makes its way to retailers in the third quarter of 2017!